Moore made the Bond role his own in his very first scene as 007 in 1973 spy caper, Live and Let Die. Using a new magnetic watch issued from Q branch, he uses it to unzip the dress of the Italian spy that came out of hiding after M's surprise visit to Bond's apartment. Continuing with Moore's first outing in Live and Let Die, the moment that always brings a smile to my face is when Bond is left stranded on a tiny island in the middle of a lake full of hungry crocodiles. As the crocs move closer and closer to him, Bond keeps his cool and comes up with a novel way to escape them by using them as stepping stones to safety. For extra chortles, I seem to remember that Bond was wearing what looked like crocodile effect shoes. The Spy Who Loved Me is in my top three Bond films - the other two being Goldfinger and Goldeneye (Bond producers take note - film titles with 'Gold' included do rather well). There are so many super moments during Moore's third appearance as the super suave spy but the pre-credit sequence deserves all the plaudits. Leaving a beautiful blonde behind after being summoned by HQ, Bond is pursued by enemies down a mountain until he seems to fall off the edge of a cliff. Will he survive? Of course he will - he's James Bond. What's more, he'll survive in style, with a Union Jack parachute opening up. Marvellous stuff. Not content with having just one favourite moment from The Spy Who Loved Me, there's another scene that stands out in my mind. Stood on a rooftop in Cairo, Bond is battling it out with one of Stromberg's henchman, Sandor. Sandor almost stumbles off the roof, but grabs Bond's tie. With Sandor still hanging off the edge, Bond asks where Fekkesh is so tells him, hoping that he'll save him. But Bond knocks Sandor's hand away, causing Sandor to fall to his death, before coolly straightening his tie back in place. "What a helpful chap." I was actually half way through watching Moonraker as a little afternoon escapism when the news reached me of Moore's death. Following the success of The Spy Who Loved Me, Moonraker just doesn't hit the same heights. But it does once again feature metal-mouthed henchman Jaws, following his appearance in the previous picture. Thrown from a plane with no Union Jack this time, Bond dives through the sky to relieve the bad guy from his parachute. He manages it too, until he finds that Jaws is hot on his tail. Well, his leg. 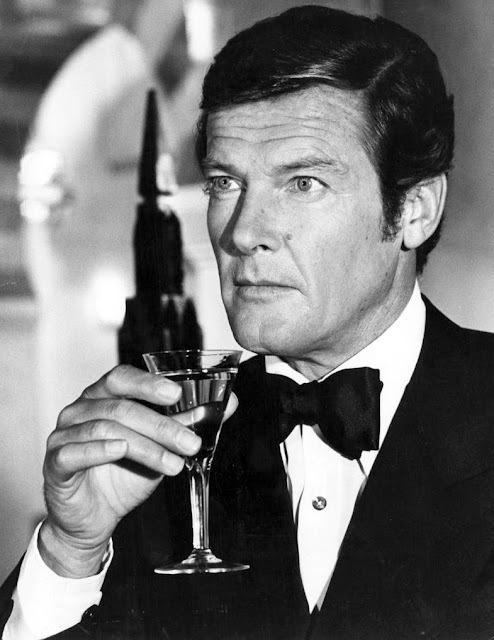 Sir Roger, you gave me so much joy as a young boy, watching Bond films whenever they were on television. I was too young to enjoy a martini then but will pour one now in your honour. I'll have to rewatch some of these classics! I'd forgotten about some of these one-liners. I really want to attempt a Bank Holiday Bondathon, watching every film from start to end. One day! I love a bit of Roj. Apparently his Bond enjoyed the company of more ladies than any other - Roger Moore by name, and nature! This did make me giggle like a schoolboy.